Have you ever been to L'Artisan des Glaces in Epcot's France pavilion? This little slice of heaven is located just besides Boulangerie Patisserie Les Halles. Sixteen ice cream and sorbet flavors are only the tip of the iceberg at this tiny, often missed spot. L'artisan des Glaces is home to the best treat in Disney World. I know everyone says that about their favorite Disney confection but trust me on this! Do you like chocolate? Ice cream? Macaroons? I present to you the chocolate macaroon ice cream sandwich. It is tasty and comes wrapped up adorably in a little French newspaper. The ice cream is chocolaty, creamy and icy cold. 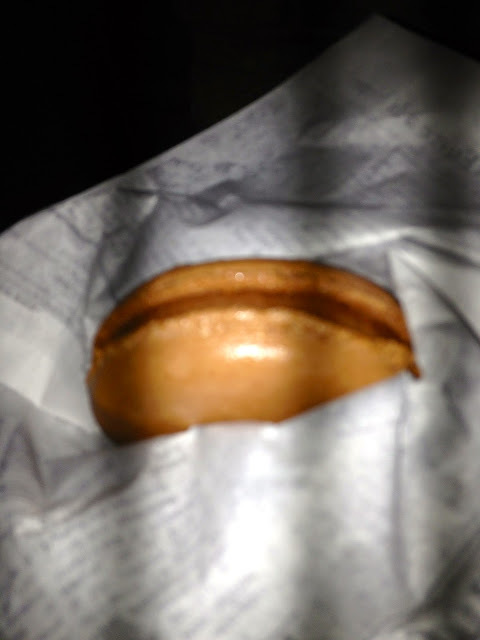 The macaroon melts in your mouth as a good one should. Perfection! The only problem I have with it is that I can't get one for dessert every night at home. Every time I go to Epcot I say I am going to try the ice cream martini. I never have room because I can resist going back daily for another macaroon ice cream sandwich. I'm going back to Epcot in 40 days (but who's counting?). I swear this time I will have the ice cream martini.....unless, well unless my little French friend beckons!